A big theme in our kitchen these days is fast food. Not like ‘can I have some fries with that’ fast food. More ‘I want to cook good eats without spending my day in the kitchen’ fast. This one pan Lasagna is made on the stove top in a skillet in about 30 min if you have some sauce handy. So easy. Take some thin meat sauce and spread it in the bottom of a skillet. Add a layer of lasagna noodles. Then a layer sauce and some fresh spinach. Then noodles. Then put lots of little small bits of noodles around the edges so you get lots of tasty noodles…then cover with a little more sauce. Add about 3/4 of a cup of water, cover and simmer for about 20 min. I opened the lid and double checked the noodles a few times. I added more water to one skillet and turned the other up a little to make sure the liquid was bubbling around the noodles. 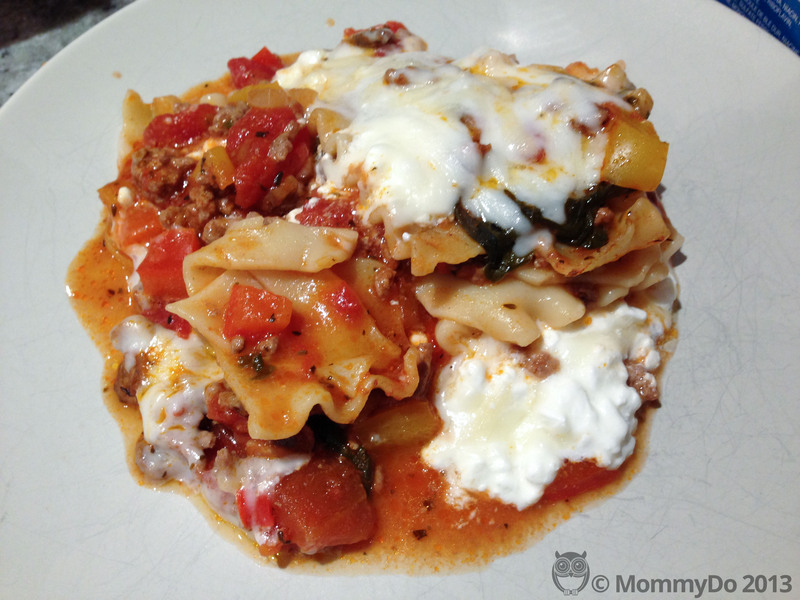 After the noodles are cooked, dob some cottage cheese or ricotta onto the noodles and cover with mozzarella cheese. Put the lid back on and cook for another 5 min. I also added a little parmesan cheese at this point. To finish, I put the skillet in the over and broiled the Lasagna Veloce for a few minutes to get that crusty “baked in the oven lasagna taste”. As you read I made 2 skillets. In the second I used lactose-free cottage cheese and goat cheese mozzarella. As parmesan is lactose free, I added that too. It’s really, really as good as the real thing. It’s currently my favourite food. I have some photos of the steps, but once again, my food photos aren’t fab. Honestly, it tastes better than it looks in my pics. cooked from scratchcookingfoodWhy Is It Never Takeout Day? Nice watermark. i was thinking that Dad would have loved this recipe. I made a version of this tonight. Way easier, and hardly nothing to clean up! Loving all your recipes.